Kory Varlen is an international lecturer and educator B.Ed. (UBC) Dip. 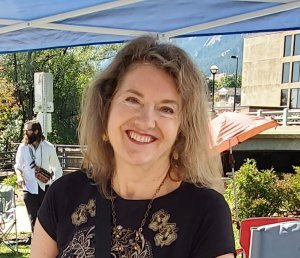 TEFL (UK), co-founder of the British Columbia Federation of Astrologers (BCFA), a practicing consulting Western Astrologer for over 30 years, and creator of her site, KOSMICK. She is a graduate (Dip. FS) from Bernadette Brady's Astro Logos School, one of the world's premier astrological schools based in Australia and the UK. In April of 2011, Kory accomplished a long-time dream of becoming a social worker and graduated from MacEwan University in Edmonton, Alberta. Since the age of 11, the right people, all at the right time, came into my life to guide my destiny. I met my first professional Astrolger and was taken under his wing when I was 11 years old! At age 16 I was on radio doing Astrology shows for my Teen Town. At 19, Vancouver's most famous Astrologer, Martha Jan Wallace, got me my first paid job as an Astrologer teaching night school courses. That was the 70-s, a fabulous time to be alive and a budding Astrologer. By my mid-twenties I was a founding member of the British Columbia Astrology Society and into the pursuit of a University degree in Education. All these studies were followed up with shamanic journeys with the K-San and Kitwancool nations of British Columbia, Canada. In the 80's I was fortunate enough to have studied with two of North America's top astrologers, Katherine de Jersey, author of Destiny Times Six and Jim Lewis, the founder of Astro-Carto-Graphy. In that most memorable of years 1984 - remember George Orwell? my destiny pulled me to the fabulous and sacred Hawaiian islands of Maui and Oahu to live, learn and practise the sacred Ho-opono-pono traditions. The 80's were a whirlwind of travelling, T.V. and radio apearances - over 100! consulting, and deep personal healing. By the late 90's I realized a life-long dream to travel South America, learn Spanish and study the Shamanic ways of the indigenous peoples of The Andes. My career as an Educator, Astrologer, and Shamanic Healer has taken me all over Canada, the U.S.A., Mexico, South America and now Europe. Since 1997 I lived in Quito, Ecuador, a magical city located right on the Equator and nestled in the Highlands of the Andes at an awesome 10,000 feet. Here my life became rejuvenated as every living organism basks in the incredible energies found at the equator where the direct rays of the sun intermingle with the phenomenal rotational forces of the earth spinning everything and everyone alive. Through the magic of the internet and SKYPE, I am able to work with clients anywhere in the world. I invite you to visit my site as often as you like and feel free to book a consultation whenever you need a fresh perspective on your life. I know you will find each and every session helpful and inspiring as that is what the purpose of our life is all about. And remember...LIFE IS HUGE! Wrap your arms around as much of it as you can and rejoice in your being. There is no one else like you on the planet. Your presence is a gift that needs to be unwrapped on a daily basis and then enjoyed.